Earlier today, Jason Kendall called it a career. The former Royals Catcher and former All Star was trying to make a comeback in AA for Kansas City, although that wasn’t thought to be the case at first. The initial word was Kendall had been dispatched to NW Arkansas to be a tutor to the younger catchers while also working with the young pitchers, most notably struggling prospect Mike Montgomery. But the next day, Kendall mentioned he envisioned “10 days in NW Arkansas, 10 days in Omaha and then back in the bigs.” To say that scared many a Royals fan is an understatement. of 2010, I was tired of Kendall. Or to phrase it better, tired of him playing every single game. Literally. It was bad enough that I wondered if Royals backup catcher Brayan Pena was encased in a giant cobweb, since he had been languishing on the bench for so long. Kendall was also not producing offensively and rarely throwing anyone out…all while batting second in the order. His shoulder injury late that year was like a godsend, as the Royals were forced to look for another Catcher. It was time for a change. 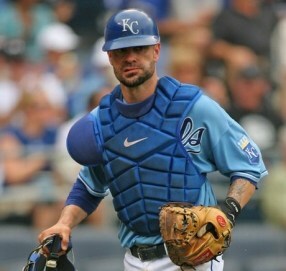 Since that time, Kendall has been used by the Royals in a coaching position in the organization, helping the younger catchers while in Kansas City. For the most part, I was okay with this. I mean, the guy is a second generation ballplayer, and just because someone wasn’t the best player doesn’t mean they can’t coach. It also gave us his infamous quote last year when a reporter asked Mike Moustakas a question that Kendall took as ‘stupid’. Who can ever remember Jason telling said reporter to “rewind yourself”? Either way, he seemed to be transitioning into his new career in baseball, and it seemed to be a natural fit. Then last week happened. To say a lot of us freaked out when it was announced Kendall was signing a minor league contract might be an understatement. Look, the Royals organization has burned us so many times that we almost expect the worse every time a decision is made by management. Who remembers GM Dayton Moore saying that Infielder Yuniesky Betancourt was going to ONLY be a backup this year? How did that turn out? Exactly my point. I was already envisioning Kendall getting called up and taking game time away from Salvador Perez, who has developed into a future All Star catcher. Kendall could be a good mentor to Perez…but it would be ridiculous to have Kendall take playing time away from Perez. That was what we worried about. Thankfully, that is all in the past now. So where does this leave Kendall? I still think he’ll get a coaching job in the organization, and I am fine with that. Like I said, I think he can be an asset. His one bad habit is he can be a bit of a curmudgeon, but hopefully that won’t rub off onto the younger players. I seriously question Kendall even trying to make a comeback with the surgery he had, but at the end of the day Jason Kendall was the only person who could have made that decision. Luckily, his body told him to shut it down before something more serious happened. How will i remember Jason Kendall? He was a hard nosed player, and I always love those guys, the ones who can’t go a game without getting their uniform dirty. He was also very strong willed, as he came back from a couple of serious injuries, including the infamous leg injury he suffered earlier in his career. At the end of the day, Kendall probably overstayed his welcome, but anymore a lot of players do that. He actually can be proud of his career whenever he sits down and looks back on it. Luckily, for us Royals fans, those days are over now.